Ever since the past month or so I've been getting occasional disconnections, we haven't really had any majorly inclement weather. Our area was one of the first service zones to receive the DOCSIS 3.0 upgrade/TW MAXX - 300/20 Ultimate legacy plan. On Friday, at around 7 PM HST I suddenly got disconnected from everything, and for the first time my modem ended up rebooting (lights were blinking alternatively). Modem couldn't reconnect to anything for 10 minutes (upstream and downstream lights were off). After the modem reconnected, I noticed both the upstream and downstream lights were a pale yellow. 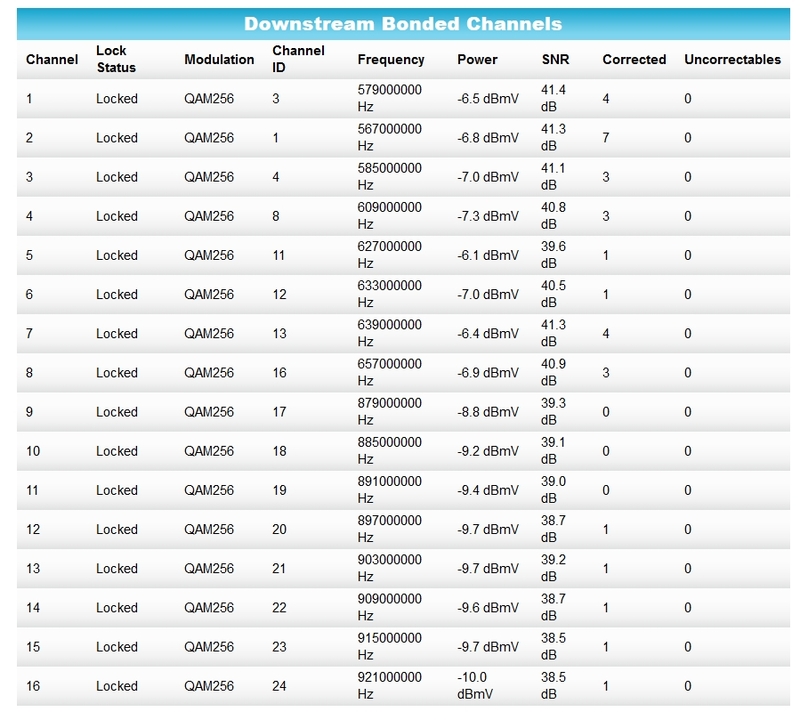 Looked this up, and it says that is due to the modem not bonding to the typical number of channels. Not knowing any better, I tightened the coax connection to my modem and restarted it - got blue lights again. Fast forward to yesterday and I notice the upstream light is pale green. Checked configuration page and noticed only one upstream channel was bonded - I was only getting 8 Mbps upstream of my rated 20, according to DSLreports. If i reboot the modem I get upstream channels for about 5-7 hours, then my modem disconnects and when it reconnects I'm back to full downstream but only one upstream channel. Let me know if you need additional info. I live in a very simple 4 apartment quadplex - any splitters is TWC installed, I did not add anything of my own. Thanks. It will not work the way it is. If you're internet only, there should be no splitters. Also, you should copy and paste the signal level page so it's easy to compare the before and after signal readings, Imgur is useless. Edit: The modem I have is an Amazon-bought SB6183, if that helps. Had it for a year and a half with no problems. I'm assuming it's not the modem that's having issues. Understood - the table that was auto-generated when I copy and pasted the Event Log is over the passage of about a month's worth of time - that stuff you see isn't all happening in a very short period, I've been having occasional messages pop up like that every few days. I rolled back my TV services all the way to Internet only + basic cable due to budget constraints. The splitter TWC installed many years ago in my bedroom has one main line coming from the outside and is a basic 3-way splitter. My cable modem is connected to one and my HDTV is connected to the other. They added a filter/scrambler to the HDTV side after I downgraded my service to basic cable. The HDTV and cable modem are the only things connected inside my house. I previously had a TV connected in my living room but I disconnected that one a long time ago. Should I call Spectrum and ask them to send a tech? I forgot to mention on Friday when that disconnect happened I called Spectrum and the tech support I got was an outsourced Indian lady with a thick accent who didn't say anything about my signal levels and just had me go through the basic troubleshooting checklist. The splitter in my room does seem somewhat corroded. Should I try to replace it myself or should I just call Spectrum to do troubleshooting? I'm assuming there's nothing Remote can do to fix the issues I'm having? Is there a way to skip over the usual stuff they have me do the next time I call and speak to a higher tier technician who can confirm what you suspect? Per some troubleshooting posts I've seen you do with other users, I disconnected the cable line going into my room before the TWC-provided splitter and connected it directly to my modem. Since I don't watch much TV anyway, I'd figure this would be a good test. These are the current modem stats right after connecting directly into the line that's going into my bedroom before the splitter. I have full bonding but I'll see how long this lasts before it screws up again. 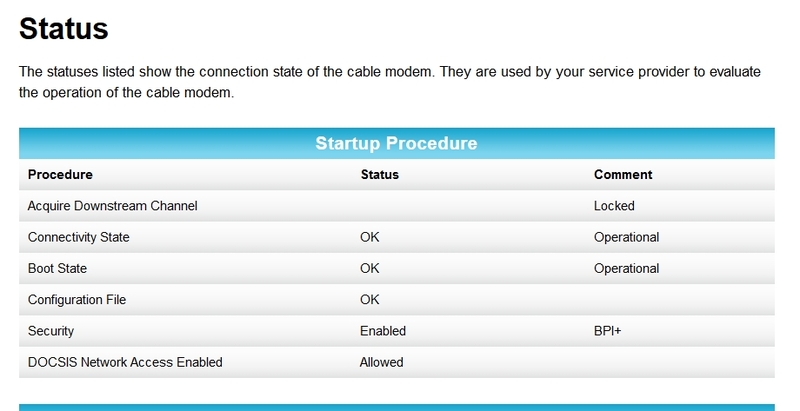 Are there any other steps you'd like me to take before I start calling TWC/Spectrum to troubleshoot? Replace the 3 way splitter with a 2 way, the open port is an issue and it may also be bad. Does the bedroom line end up going straight out to the pole wirh only a grounding block by the electric meter? It already is a 2-way splitter (and from some more research I learned it's a simple two way tap, it seems). I'll get a replacement one if that's the problem. One was going to my HDTV and one was going to my cable modem - no third open port. I traced the line coming into my bedroom and your suspicions are correct - it's connected to a three-way splitter on the outside. Sorry for the bad lighting - took this at night. My bedroom is connected to that splitter on the far right side (not the one on the upper right though). My bedroom is the far right connection on that, and I believe one connection of that splitter goes to my living room (which is unused) and the other connection of that splitter goes to my rear bedroom (which is also unused). I couldn't go to the upstairs area but it appears this is more or less this quadplex's "demarcation point" because when I tried to follow the general routing of the line that feeds my apartment, it seems to go to the roof (just a story above) and then this bare black cable goes from the roof to the telephone pole outside. So yeah, you were correct in saying that there is a splitter on the outside before the 2-way tap in my bedroom. Knowing that, are the numbers that I posted before seem fine then? I'm assuming that bulky connector before the line that feeds my home is the filter they installed after I downgraded my service to basic. Also, there appears to be a 2-way splitter on the left side *before* the three-way that feeds my apartment. My apartment's run appears to start with that black coax that feeds into that bulky connector filter while the white one appears to be going to the next door neighbor's apartment. Is it safe to say that the corroded 2-way tap that was in my bedroom was the problem? Will TWC care if I choose to go up and unhook the 3-way outside splitter and couple my bedroom line to the main feed (before the outside splitter) since I'm not even using the living room and second bedroom lines anyway, or would I be better off asking them to send a tech to do that? All that stuff shown up there is a bare installation exposed to the elements, thankfully on a side that doesn't get hit by rain that often and isn't subjected to sunrise/sunset. I've already tried to contact Spectrum support once and I ended up talking to an outsourced representative - would love to be able to talk to a local Hawaii TWC tech support person but the customer support system doesn't have an easy way to get to the tier 3 guys. Is It marked 3.5 - 3.5 dB and not a 1- 10 direction coupler with an in out and tap port? If so, the outside goes to the in port, modem to the out and tv to the tap port. By the "inside 2 way", you're talking about the one in my bedroom or by "inside" you're talking about that 2-way on the left side of that exterior picture? By jumper, do you mean the line that feeds that two way you were talking about (the inside 2-way) or do you mean the run to my bedroom (that connection on the far right) that might be bad? The splitter in my bedroom is marked 3.5 db on both the "out" ports. My cable modem is connected to one 3.5 dB "out" and my TV is hooked up to the other 3.5 dB "out". The splitter is a CommScope SV-2MG. The line going from the outside to my bedroom was hooked into the "IN" part of the bedroom splitter. Only other mark on this thing is something saying "5-1002 Mhz". The label on the back of this splitter appears to be completely gone. This is the splitter in my bedroom - I'd have to grab a ladder to see what's on the outside one. Guess I'll give TWC a call at this point. I am tempted to bypass the 4-way splitter and hook my bedroom directly into the black coax line that feeds the 4-way, but I'm not sure if TWC is going to like that. ok, If you saw an 8 dB improvement with that splitter removed, either the splitter is blown out or one of the2 jumper cables, either the cable box or modem one) has an issue. You should only see a 3.5-4 dB change not 8 dB! verify the center wire is shiny copper and extends 1/8" beyond the nuts and there's no foil or wire strands across the center to metal barrel. I only see what looks like a 2 way and a 3 way on the outside left and something upper right, if that's a 4 way, where do 2 of the ports go? The Can in line is either a internet only filter trap, a MOCA poe filter or a CISP... but, the 3 way should be bypassed and only the line to your bedroom connected. Next I find the red labelled splitter unusual as TWC has theirs labelled with a silver and blue TWC logo. But open lines on any port creates unpredictable imbalances that must be repaired.